Simply because there are SO MANY fabulous records that were released during my favorite era of music, I am hesitant to make up top ten lists or pick favorites. Listening to this record today, however, I can think of none that are "better"; this is absolute music perfection, laid out between two sides that total 4:41. Today is my birthday, and I tend to get reflective on days like this. Thanks to social networking (it's not ALL bad, you know), I been flooded with incredible words from friends all around the world. I'm not trying to brag, but I feel incredibly fortunate that I have been able to work in the music biz all around the world, and have met hundreds of incredible people along the way, and it shows that the gap between us all is incredibly small. We may be thousands of miles away, but we're all very, very similar; languages and colors are NOT a divider, only a reminder that life is not black and white but made up of billions of colors, and the flavor of our diversity is akin to how we season our food. If there is no flavor, it's bland and who wants that? King Solomon. We lost him recently but the records that he bequeathed upon us are some of the most moving, beautiful and REAL pieces of art that can ever grace our ears. I know I'm writing more than usual today, but there are so many moments in "Home In Your Heart" that are mindblowing; first off, whoever is behind the drum kit has a direct hotline to MY heart, and his stop time fills are not only impressive but so effective to complement the lyrics. Then there's the matter of Solomon's voice; in a world full of musical fakery, this is a man that fully believes what he's singing here, and throws his entire soul into the performance, sending the microphone, preamps, and/or tape machine into distortion at JUST the right times, as the distortion drives home words that he wants to enunciate with even more color. It's all capped off with a slightly sinister laugh at the outro...I've listened to it a dozen times this morning and I could easily listen a dozen more. "Words", the other side, is one of those southern soul ballads that helped make Solomon the stuff of legend early in his career; Solomon's effect on his female fans is the type of lore that is best devoured in Guralnick's excellent "Sweet Soul Music" book. I hope you enjoy today's post; it's possibly the greatest record ever made. But I could just as easily give that award to "Cry To Me"... Good, better, best doesn't really matter; I'm simply thankful for ALL of it. Since I've already turned in more words than normal, I'll tell you the story on why I started this blog. I had just been through the most difficult breakup of my life, and I realized more than ever that music was the salvation, specifically those little records that spin at 45 RPM. I figured that since they brought so much happiness to my life, it only made sense to spread the love; it's heartwarming when I receive messages thanking me for what I do, because it's validation that my intention has been a success. 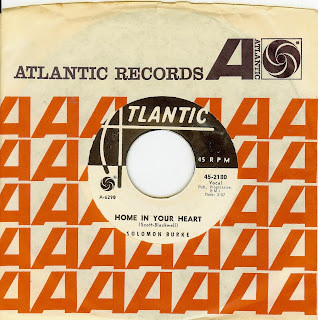 Indeed, "Home In Your Heart" is one of the greatest sides ever cut, anywhere, by anyone. The album "The Best Of Solomon Burke", released in 1966, is one of the first records I ever remember playing. Of course the record had been available for 25 years before I heard it, but It was brand new to me and I totally loved it. I took that Lp from my grandmother's house when she died and still have it. It's an original issue in mono. The track "Everybody Needs Somebody To Love" is almost completely worn out at this point. Thanks for spreading the love over the years. You're definitely in the top 10 of those who've contributed to my musical education. And for that, I thank you. Much happiness to you on your birthday. Hopefully, a trip to the record store is part of the celebration. Derek - again, best wishes for a very happy birthday & thank you for sharing your passion & your joy. Words has a churchy feel to it, and has a 50's element as well. Hi Derek - have a very happy birthday.It's a treat to read such a passionate piece of writing. Your love for the music shines through! Can't wait to listen to these songs. Can you believe - I don't think I've ever heard them! Derek, happy birthday, and a great choice indeed! Love this song - Home In Your Heart - it's one my top 3 favorites from Solomon, along with Down In The Valley and Stupidity. Love your blog, and your song selections - this is one of my daily go-to blogs. I could never convey to you just how much your site means to me. Growing up with a father who was an outstanding classical and jazz musician, who had his own jazz radio show at the voice of america back in the 50s and later on headed up the jazz club at the UN, needless to say i was immersed in music from the day i first had an attention span. when i was a little kid in manhattan back in the 60s, i used to fall asleep listening to my mom's radio under my pillow. and the music i listened to most often is the kind that you regularly feature here: 60 soul and r&b, my first love. I can never thank you enough for what you do, bringing me the music that always has and continues to bring joy to my heart. hope you have the happiest of birthdays, mon ami, et merci mille fois! thanks for all the kinds words, everyone! Happy Birthday, Derek! Having just been through my own horrific breakup (5.5 years), these shots of soul are what keep me going. Thanks again.